Farm Founder Anne Geyer, members and others talk about the Agriberry Farm Fruit CSA. 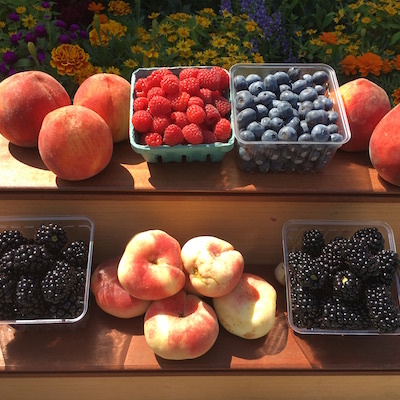 With Agriberry Farm’s Fruit CSA (Community Supported Agriculture) programs, members receive weekly pre-made boxes or “harvest shares,” of fresh, local fruit grown by Agriberry Farm and our Partner Farms. Across the 20-week Summer Season CSA or the mini-Fall Season CSA, weekly share boxes include as much diversity of flavor and texture as the mid-Atlantic region can offer. Some items with limited availability may only be included once, and some fruits–especially our berries–will be included frequently. Each week’s share box composition is determined by our harvests and that of our partner farms, and each share will feature berries grown by Agriberry Farm. New for the 2019 Season, members of the Richmond Area CSA will have the opportunity to indicate preferences and customize their share each week before pickup via the HARVIE system. Other CSA area share boxes will be pre-determined. While we try to vary the content our weekly boxes as much as possible, whatever berries or fruit we (and our partner farmers) are harvesting will likely be available for your share. Here’s a link to what has some been included in shares for many past seasons. Here are some Frequently Asked Questions about Agriberry Farm’s CSAs. Community Supported Agriculture programs are often referred to as “CSAs.” This general term describes many types of farm-direct, pre-season purchase agreements between farmers and their customers. CSA programs enable farmers to raise vital cash during the non-harvest season, and farm members gain a deeper relationship with the farms they choose to support. Learn more about how the CSA benefits members, the farm and the community-at-large. Part of being a CSA member involves embracing the challenges of seasonal eating, which can mean experiencing scarcity and abundance, a concept that has been lost from modern diets thanks to the year-round availability of perishable produce. Once the initial craving for a particular fruit has been satisfied and the novelty has worn off, receiving subsequent additional units of that fruit can provide the opportunity for preserving some for use later in the year, or for exploring new uses and recipes. Conversely, in some seasons, depending on prevailing weather conditions, members may not receive as much of a certain fruit or fruit type as they would wish. The Geyers are a family of experienced, professional farmers, who know how to grow delicious, nutritious fruit. And, their carefully selected Partner Farmers are equally skilled and careful. All field-grown produce, however, is subject to the effect of regional weather patterns and other growing conditions. These unpredictable elements can directly affect–both positively and negatively–the quality and availability of the fruit available for a day, a week or for an entire season. Because our our harvest areas are localized to specific fields, the impact of weather is greatly magnified versus large-scale production and distribution, simply because it’s not diluted across multiple regions, states or even countries, as we are used to with the year-round produce supplies in grocery stores. Bottom Line: CSA memberships are not a guaranteed purchase of a specific amount of fruit, but rather an investment in the farm and community. This complex, multi-faceted relationship is enjoyed each season by many area families, many of whom renew year after year. Reserve Your RVA Share Now!